I love bulgur because it has a fantastic nutty flavor and chewy texture and is like a blank palette to create different versions of a main meal or side salad. I created this one with Italian-inspired ingredients that were so flavorful that a dressing wasn’t needed. However, you can always toss it with an Italian vinaigrette. I highly recommend making your own sun dried tomatoes, but bottled will work in a pinch. Mix it up your way by using shrimp instead of chicken or omit the protein for more of a take on a side salad. The picture shows more veggies than bulgur and of course you can double the amount of bulgur if desired. Ingredient amounts will serve 4 as a side salad or 2 as a meal. Cut tomatoes into wedges, place into large bowl and toss with oil, salt and pepper. Pour all contents onto a cookie sheet and place into a preheated oven at 250 degrees for about 1 1/2 – 2 hours or until semi wilted and slightly browned on the edges. Set aside.Cut tomatoes into wedges, place into large bowl and toss with oil, salt and pepper. Pour all contents onto a cookie sheet and place into a preheated oven at 250 degrees for about 1 1/2 – 2 hours or until semi wilted and slightly browned on the edges. Set aside. Cut the red pepper into thirds and remove seeds and some of the pulp from the inside of the pepper. Flatten pepper as much as possible. Place on a baking sheet lined with foil or coated with non-stick cooking spray. Broil on high for about 15 minutes or until mostly blackened. Check frequently. Allow to cool. No need to place in a bag. Once cooled remove skin, but do not run under water to remove any blackened skin, because it will compromise the flavor. Chop and set aside. Cook bulgur according to package directions, this should take about 30 minutes. I am using chicken broth in place of the water it calls for. While bulgur is cooking slice the olives, mince the parsley and grill the chicken breasts. Coat the chicken breasts with olive oil and season with salt and pepper. Using a grill or grill pan heat to medium high and cook the chicken on both sides for about 5 minutes each. Allow to rest for 5 minutes before cutting into bite sized pieces. Cooking times will vary on the grill or grill pan you are using and the thickness of the chicken. No pink should remain in the middle. Once chicken has rested, cut into pieces. 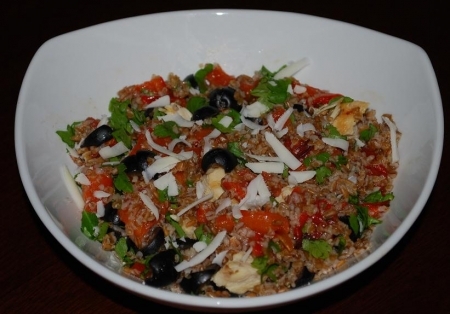 In a large bowl, add the chicken, sun dried tomatoes, red bell pepper, bulgur, olives, parsley and toss. Garnish with cheese and serve. Try Straccali Chianti (Tuscany), Romanelli Chianti, Healdsburg Ranches Appellation Series Pinot Noir (Russian River Valley), Bogle Vineyards Pinot Noir (Russian River Valley), Peroni Nastro Azzurro® Birra (Italy) or Flensburger Brauerei Gold Premium Lager Beer (Germany).